Do Jedi Go Trick or Treating? 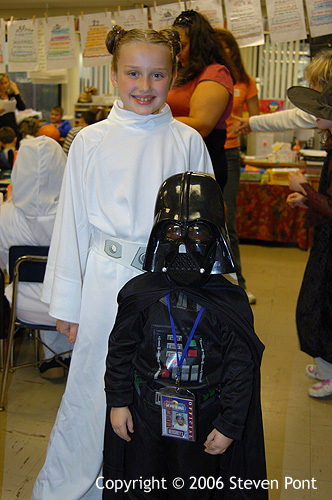 In the last of our Halloween series, we again see young Darth Vader. The paparazzi caught up with the pint-sized Dark Lord while he was vacationing on the forest moon of Endor with his childhood sweetheart and his good friends, the Ewoks. Historians think that this was a turning point in Vader's life. They knew that he was upset at being disturbed during his vacation, but they didn't link him to the photographer with the crushed trachea until much later. Contrary to popular belief, Darth Vader wasn't always the towering figure that he is usually believed to have been. The deep voice and the ability to choke people with the Force made him appear quite formidable, but back in his younger days, he was actually a bit below average. 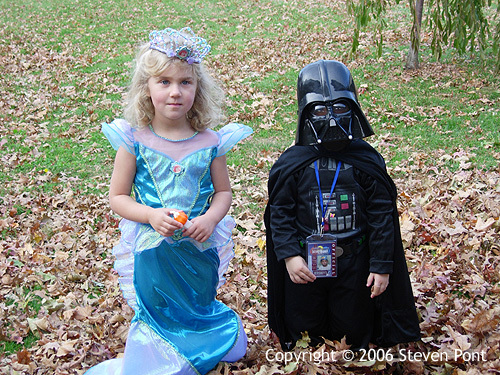 Here we see the young Dark Lord at recess with Leia Organa. They were good friends until that ugly incident involving a peanut butter sandwich and a trash compactor. Some people decorate their houses for Halloween. Some people even go a bit overboard in that endeavor. (You know who you are.) I prefer a little more subtlety. 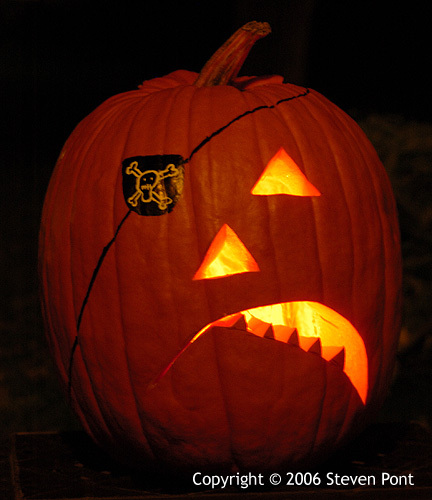 I'm happy if I get one good jack-o-lantern out of the deal. Aaargh. Pumpkin design by Jackie. Copyright 2006. All rights reserved. No part of this pumpkin may be reproduced or transmitted without the express written consent of iPont Shuffle Enterprises.